Establishing connection, getting Derbs to reach out and down to the end of the reins. I’m very fortunate to ride with some of the nicest people I’ve ever met. Our ages span more than six decades, starting with our youngest riders who are newly turned teenagers. All are supportive and friendly, but not effusive, unless somebody shows up with the divine new saddle pad and then yes, I admit, there might be some excited discussion of coordinating polos and general gushing. But when you ride with Christy, you develop an eye for (and a real appreciation of) correct work, so the compliments we tend to pay each other are genuine, and they are earned. Which is why Derby I have not been on the receiving end of any over the last few, frustrating months. Then last night, something happened that has never happened before – another rider stopped and watched the end of the lesson, and a minute later, Christy dashed out of the arena to get her camera. What was creating the fuss? 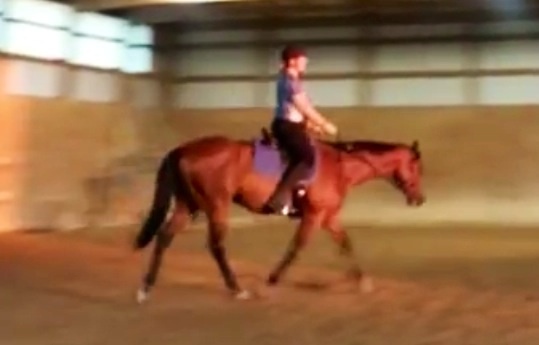 On the face of it, not much – it was basic trot work, but with a big difference. I had finally managed to develop a genuine connection and apparently it looked as good (and dramatically different!) as it felt. 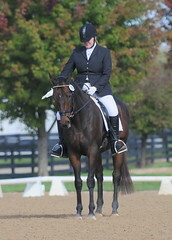 Connection starts with the rider’s leg powering the horse forward (1) and ends when energy is returned to the rider’s hand (8). By “connection” I’m not referring to roundness or contact. By “connection” I mean that I was generating power from Derby’s hind legs, which was carried through his top line and into the reins, then returned back to me, allowing me to recycle, store or deploy it as I wished. It’s an unbelievable feeling of power, not unlike that feeling you get as a plane is taxiing for takeoff, when you can feel the power of the engines propelling and then lifting the jet off the runway. We were drilling the new position, getting me out of my hips and into what feels like a less rigid, not forced and more following and balanced seat. When I get there, effect on horse is immediate – his back comes up and carries himself really nicely. As I drilled the position on a loopy rain, in order to stay out of his face, Christie had me add more power, and more power again, from the back end. Pretty soon Derby had stretched out to the end of those long reins, completing the connection. I think that’s the key part. The horse has to complete the connection. It felt amazing. Derby’s back was up and swinging. His trot felt powerful and springy. Best of all we maintained it, loop after loop. That’s when Christy went dashing for her camera. We gave it a shot but our second attempt wasn’t as good as our previous – both Derbs and I were getting tired by this point. The video isn’t great but the still pinned to the top of this post shows how differently Derby was moving once I figured out to really invite him to reach into the contact and create that closed loop that generates the power that underpins correct dressage. It was a great ride, and the extra affirmation from my fellow barn denizens was better than any ribbon.